The multi-award winning Piggyback Rider® engages parents with their children in active transport, year round on every outing, by creating a mutually enjoyable, effortless way to carry toddlers at your back. The innovative, unisex design incorporates standard backpack adjustments to distribute the child’s weight at your core, while they stand firmly on the tempered aluminum bar supported by the shoulder carrier. For safety, the child holds integrated grab handles and is secured by the basic safety harness. Children love the height advantage, rest, quality time and longer adventures, while you walk with a natural upright posture. Ride the bar! NOMIS Basic Carrier Features include a robust foam core for comfort, a cell phone or iProduct pocket on the front, a rear zip pocket for small items, basic child safety harness and a multi-use storage bag. NOMIS Deluxe Carrier w/ 1L Hydration Includes: Piggyback Rider carrier, deluxe safety harness with Hydrapak Elite 1.0L hydration bladder, and carry bag. 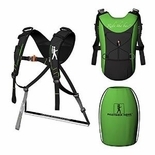 Features include a robust foam core for comfort, a cell phone or iProduct pocket on the front, a rear zip pocket for small items, deluxe child safety harness with 1L hydration bladder and a multi-use storage bag. NOMIS XL Backpack Includes: Piggyback Rider backpack carrier and basic safety harness. The Piggyback Rider Backpack features the patented toddler carry system integrated into a standard backpack. The standing bar is stowed within the backpack, ready for use anytime, anywhere. Unzip the pouch and the bar drops down ready for use. For safety, the child holds integrated grab handles and is secured by either the basic or deluxe safety harness (basic harness included). Kids Deluxe Safety Harness with 1L bladder The kids deluxe safety harness is compatible with any Piggyback Rider® child carrier. Every deluxe harness includes a 1L Hydrapak Elite hydration bladder, quick storage elastic webbing, and a small mesh pocket. The Deluxe unit also includes attachment points to retain the safety tether clips when not in use. The Deluxe safety harness may be used independently of the Piggyback Rider carrier as a hydration backpack.